We just can't stop adding new stuff to our Candy Store here in Dallas. 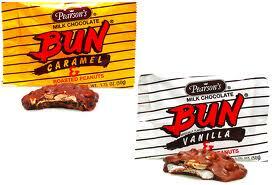 This weeks new add's are the Pearson's Nut Goodie Bar, The Bun Bar in Vanilla & Caramel & the Nut Roll. That's right candy fans.. were nuts. First lets talk about the Nut Goodie. 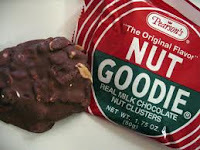 A Nut Goodie is made of milk chocolate and nut clusters, weighing in at 1.75 oz of Nut Goodie-ness. Introduced to the world in 1912, its a cluster of real milk chocolate and nuts with a maple favored center. Those aren't just any peanuts, they are fresh, unsalted Virginia peanuts too. Lets move the discussion on to the Buns. Bun Caramel & Bun Vanilla. Bun's are nut and milk chocolate patty filled with a white fudge/fondant (vanilla or maple) or caramel. This bar was originally made by the Wayne Bun Candy Company back in the 1920s. The Bun Bar was bought by Clark and then later sold to Pearsons in 1998. Same as above, these are made with fresh unsalted Virginia nuts and real milk chocolate. We also brought in the Pearson's Salted Nut Roll. While Pearson's cant be known for their catchy product names, they are known for the use of real milk chocolate and (here we go again) fresh unsalted Virginia peanuts. The Salted Nut Roll is a creamy nougat center, surrounded by caramel and rolled in those nuts. We got these in Wednesday of this week for the first time so if your a fan, look no further, the nuts stop here at Blooms Candy Store in Carrollton (Dallas).